Body camera footage shows a sheriff’s deputy braving flames to rescue a disabled woman and get people to flee from a lethal wildfire that has already begun devouring a Northern California community. “Go! Go! Go! Go! Go!” the unnamed deputy yells at one point to drivers who are hesitating and moving slowly as they flee. The video was released Friday by the Sonoma County Sheriff’s Office of the community of Mark West, which is lit up orange with flame and so thick with smoke it’s difficult to see. The deputy, wheezing and coughing, runs to several doors shouting “sheriff’s office!” for anyone who may be in earshot. He then comes across another deputy with a woman in a wheelchair right next to a house that is burning and lifts her into an SUV to take her away. Back in his car, he appears to drive straight through the flames at one point as he tries to help evacuees to safety. California regulators are directing Verizon Wireless, AT&T and other communication companies to preserve any evidence and records that could potentially be linked to Northern California wildfires that killed 35 people. In a letter Friday, the state Public Utilities Commission told the companies to preserve failed or damaged poles, conductors or other equipment or documents that might be related to the fires. The agency sent a similar letter Thursday to the state’s largest utility, Pacific Gas & Electric Co.
California officials are investigating downed power lines and other utility equipment as possible causes of wildfires. The order was also sent to Sprint, T-Mobile West, Frontier Communications of California and Comcast Phone of California. Gov. Jerry Brown and U.S. Senators Dianne Feinstein and Kamala Harris are scheduled to visit Sonoma County on Saturday. The county has been hit hardest by the raging wildfires that devastated the state’s wine country since Sunday night. Brown has remained in Sacramento this week, where he has issued emergency declarations and secured federal disaster relief. His office said in a statement that with some conditions improving and firefighters making progress on a number of wildfires, he will visit the fire zone and provide additional details when he gets there. The fires claimed 35 lives and destroyed at least 5,700 homes and businesses. Authorities have confirmed three more deaths from the wildfires in Northern California, bringing the total to 35. The raging fires have destroyed at least 5,700 homes and businesses. California Forestry and Fire Protection spokesman Daniel Berlant said Friday that the numbers make this the deadliest and most destructive series of wildfires in California history. The Napa County Sheriff-Coroner says a forensic team found two more dead at a home there. They say one of the men killed was 89-year-old George Chaney, a retired doctor. The second man is believed to be 79-year-old Edward Stone. The Mendocino County Sheriff’s Office also confirmed another death, but provided no details. The football game between No. 8 Washington State and California is scheduled to be played Friday night in Berkeley as planned despite poor air quality because of the fires in nearby wine country. The Pac-12 said that the conference and schools decided Friday afternoon to play the game as scheduled at 7:30 p.m. The conference said the safety of players and fans drove the decision. Cal will work with the Bay Area Air Quality Management District to monitor conditions leading up to game time. Thick smoke and ash have filled the Bay Area since the wildfires started Sunday about 50 miles north of Berkeley. The fires have killed more than 30 people and destroyed thousands of homes and businesses. Pacific Gas & Electric Co. shares plummeted 10.5 percent after state regulators directed the company to preserve any evidence of failed poles, conductors or other equipment that might be connected to Northern California wildfires that killed 32 people and reduced entire neighborhoods to rubble. The steep one-day fall Friday means the value of the giant utility, or market capitalization, dropped about $3.5 billion, from $33.1 billion to $29.6 billion. California fire officials are investigating downed power lines and other utility equipment as possible causes of massive wildfires that have destroyed at least 5,700 homes and businesses. The California Public Utilities Commission also directed the utility to tell employees and contractors to preserve emails and other documents related to potential causes of the fires. Fire officials say about 5,700 homes and buildings have been destroyed by wildfires burning in Northern California. California Forestry and Fire Protection spokesman Daniel Berlant gave the new number Friday afternoon for the damage done since Sunday night by more than 20 wildfires burning mostly in the state’s wine country. The figure is up 2,200 from the 3,500 destroyed homes and buildings previously announced. The blazes have also driven 90,000 people from their homes and killed 32 people. California officials say it will be weeks before they determine the causes of the wildfires sweeping the state. Ken Pimlott, the state’s fire chief, said Friday that 20 investigators alone are in Sonoma County looking into the cause and origin. Part of the problem is that much of the evidence was consumed in the fires. That means investigators must look for other clues to decide what happened. They are not yet ready to say whether any were caused by downed or sparking power lines from the strong, gusty winds that plagued the state overnight Sunday into Monday. California fire officials say wildfires across the state have chased about 90,000 people from their homes. The evacuation figure was released Friday by the California Department of Forestry and Fire Protection. CalFire says the majority of evacuations were for communities affected by fires in wine country north of San Francisco. Since igniting Sunday in spots across eight counties, the blazes have killed 32 people and destroyed at least 3,500 homes and businesses. Deputies have arrested a man suspected of looting in an evacuation area of Sonoma County, the county hardest hit by wildfires burning in Northern California. The Sonoma County Sheriff’s Office says deputies arrested Morgan Plumere, of Sonoma, on Thursday after he was spotted stealing sunglasses from a car in an evacuation area. The office says deputies who searched him found the sunglasses, items that had been reported stolen from a local vineyard and an emergency fire shelter taken from firefighters. Plumere was arrested for looting, possession of stolen property, possession of drug paraphernalia, Possession of prescription medications without a prescription and violation of probation. Sonoma County prosecutors warned Friday every case of looting will be prosecuted. Authorities say they have found another body in Sonoma County, raising the death toll to 32 and making this the deadliest week of wildfires in California history. Sonoma County Sheriff Robert Giordano said Friday that 30 detectives continue to work on finding missing people and that his office has more than 200 pending reports of missing people. Dozens of search and rescue personnel are on site at a mobile home park in Santa Rosa, California, searching for residents who didn’t make it out before fire swept through. Santa Rosa, a city of 175,000 people, was one of the hardest-hit communities during the wildfires that ignited Sunday night. At least 9,000 firefighters from across the state and the country are attacking the flames. Dozens of search and rescue personnel are on site at a mobile home park in Santa Rosa, California, with the grim task of searching for residents who didn’t make it out before fire swept through. Sonoma County Sheriff’s Sgt. Dave Thompson says officers recovered bone fragments from one person Friday morning. He says there’s a “high probability” they’ll find more. Officials believe there may be two or three more bodies in the leveled remains of the mobile home park. Thompson calls it “very tedious work.” A crew of men and women in white suits are standing by. Fire tore through the Santa Rosa area early Monday, leaving only a short window for people to try to escape from the flames. 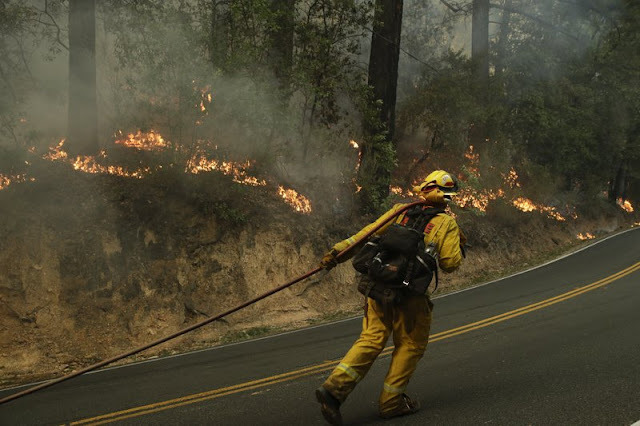 Fire officials say thousands of firefighters have poured into California in the last 24 hours and that more than 9,000 are now fighting several major blazes. California Department of Forestry and Fire Protection Chief Ken Pimlott says the additional crews helped make gains overnight. He says that two of the biggest blazes burning in Sonoma and Napa Counties are now at least 25 percent contained. Pimlott says dangerous fire weather is forecast for this weekend and that additional fire crews and equipment will be ready to deploy should new fires ignite. Blazes burning across eight counties have killed 31 people since Sunday and destroyed at least 3,500 homes and businesses. Firefighters gained some ground on a blaze burning in the heart of California’s wine country but face another tough day ahead with low humidity and high winds expected to return. Since igniting Sunday in spots across eight counties, the blazes have killed 31 people and destroyed at least 3,500 homes and businesses. Pope Francis says he’s praying for all those who have lost loved ones or are searching for them in the wildfires devastating California. Francis sent a telegram of condolence Friday to San Francisco Archbishop Salvatore Joseph Cordileone and Los Angeles Archbishop Jose Gomez. Northern California communities have been battered from wildfires that are nowhere near over. They’re trying to save or recover what’s left of their homes, find lost loved ones or mourn their dead, with the constant threat of the fires still looming. The death toll climbed to 31 on Thursday, making it the deadliest week of wildfires in California history. Hundreds more are injured or missing. In areas where they were able, cadaver dogs were sniffing through the ashes. A total of 21 fires spanning at least 300 square miles (777 square kilometers) are burning, most of them less than 10 percent contained. Evacuees fled to friends’ houses, shelters and even beaches. 0 Response to "The Latest: Video shows California deputy braving flames"